Birds of a feather flock together. Right? Well, as of late, designers sure have. 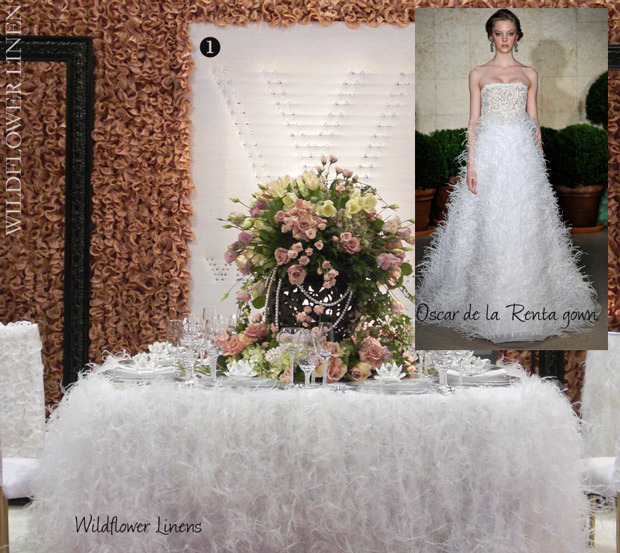 This season’s hottest wedding accessory – feathers – have been showing up in tablecloths! 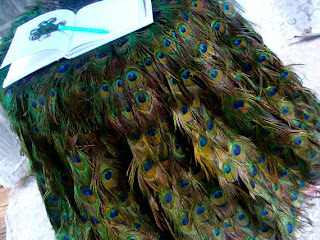 If colorful statements are more your thing, try this beautiful peacock feather tablecloth. Notice the feathered pen that provides that finishing touch! Perfect for lively wedding receptions. If you are looking for something more elegant, but all white just isn’t your thing – try a white tablecloth with black feathers. This one specifically is hemmed with gorgeous black feathers, but yours can be done anyway you please! Imagine one with tufts of feathers, or even a black and white feather pattern. Also, if you are thinking about a feather themed wedding, or just want to see more of this stunning art, check out some of our older blog posts. Feathers never go out of style! We’ve featured many wedding accessories that are feather themed. Scroll back through time and you’ll see – feather weddings really are timeless. Have you been to a feathered wedding recently? Is there something that really catches your eye? Let us know in the comments below!